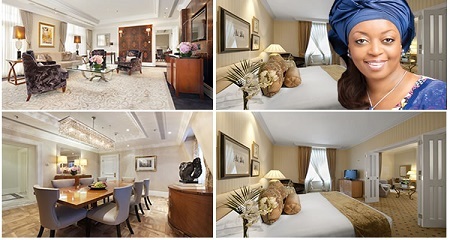 Is an N800,000/night London presidential suite at Nigeria’s expense Madueke’s new hideout as she plans “soft landing” strategies? Is Ms. Madueke still living high off the hog at Nigeria’s expense at a London hotel in a presidential suite? As Investigation intensifies on the fraudulent activities of former Petroleum Minister, Diezani Allison-Madueke, the woman has continued her flamboyant lifestyle living in a Presidential Suit at the Landmark Hotel, London at the cost of £2,680.00 per night (about N800, 000.00), pointblanknews.com investigation reveals. Landmark Hotel is located on 222 Marylebone Road, London and it is reputed to be one of the most expensive hotels in England. Mrs. Allison-Madueke had left Nigeria shortly before President Mohammadu Buhari was sworn-in under the guise of seeking medical attention. Sources said her medical situation has been exaggerated as she is merely looking for an escape route. Sources close to the former Minister told Pointblanknews.com that Mrs. Allison-Madueke who now wears a low cut hair style to disguise her person, spends her time at the Presidential suit from where she sends emissaries to President Mohammadu Buhari to grant her some soft landing in the current probe of her activities as Petroleum Minister under the President Goodluck Jonathan’s administration. The source who does not want to be named confirmed to Pointblanknews.com that the once very Powerful Minister checked into the Hotel in May using the name of one of her close aides for fear of being identified and monitored. Pointblanknews.com could not ascertain the name of the aide used to check into the Landmark Hotel because the source fears it could expose the exact room the former Minister has been staying since June. “I cannot give you the exact name she used or the room number but believe me, she has been at the Presidential Suit of Landmark Hotel since June. I have been there severally and I have seen her there too,” the source told Pointblanknews.com. Pointblanknews.com gathered that most of her cronies and those who benefitted from the oil swap deals which is a subject of investigation have had series of meetings with her at the hotel, building up possible defenses ahead of the investigation. As minister of Petroleum Resources under President Jonathan, Mrs. Alison-Madueke became one of the most powerful Nigerian government officials. Several reports have linked her to sleazy oil deals and a penchant for wastage of public funds. She allegedly spent some N2 billion on private jet rentals, according to the petition submitted to the EFCC by Enugu-based “Crusader For Good Governance.” The petition was signed by Okechukwu Obiora Nnamdi, the group’s leader. North American countries, according to the petition. The petitioners listed some of the minister’s most lavish trips. • During Easter break, she flew a private jet to Dubai with members of her family at the cost of $300,000. • During President Jonathan’s visit to South Africa, she flew in a private jet that cost Nigeria $300,000. jet is $500,000 per month. • Ms. Allison-Madueke went to a meeting of the Oil Producing and Exporting Countries (OPEC) in Austria in a private jet. In addition, the petitioners alleged that, for two years, the Petroleum minister never attended any meeting outside Nigeria in a commercial jet or in any of the jets maintained by the Nigerian Presidency. They stated that she had wasted more than N2 billion on the maintenance of aircraft in the last two years. They accused her of being the only minister who consistently uses private jets to arrive at destinations when the Nigerian president travels abroad. The petition also carpets Mrs. Allison-Madueke for often doing official jobs out of her house, which means that she is frequently absent from her official desk at the ministry. As alleged in the petition to the EFCC, Mrs. Alison-Madueke also frequently uses the services of Vista Jet, a Swiss luxury aviation company that provides jets to wealthy businessmen around the world. Vista Jet has done deals with such Nigerians as Governor Godswill Akpabio of Akwa Ibom State and Nduka Obaigbena, the flamboyant publisher of Thisday newspaper. Curiously, Vista Jet has a Nigerian businessman, Kola Aluko, on its board.Mr. Aluko, who once acted as Vista Jet’s West African representative, is known to be close to Ms. Alison-Madueke. “[Kola] Aluko and Mrs. Diezani Allison-Madueke are neck deep in the oil business,” said a source at the NNPC. “She helped him [Mr. Aluko] to land a choice allocation of pricey oil blocks through a company called Seven Energy,” added the source. In a petition sent to the Nigerian Senate by the Delta Producing Communities, Ms. Alison-Madueke is accused of transferring the ownership of four oil mining licenses (OML), 30, 34, 26 and 42, to Atlantic Energy Drilling Concept which belongs to Mr. Omokore. Are you Very Sure of these ?